Description: What a shock! Tyger escaped a year ago while we were on vacation for less than a day and this was our second surprise of the winter. This guy has lots of heart and stamina being able to survive a mid-winter birth with 10 inches of snow. This boy has matured into something really special. We can see it and the judges can see it. He has fantastic color, but his build is great. He is just the total package! 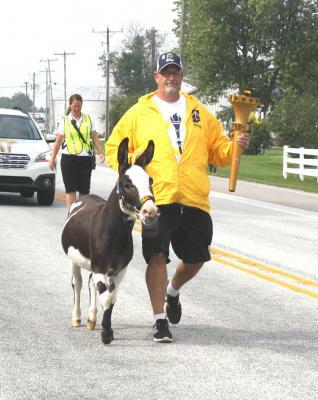 Oreo was chosen by Scott Spahr, the Director of the Boys & Girls Club of Morristown, to run in the Indiana Bicentennial Torch Relay. He was such a good boy. It was such an honor for him and ASSphalt Acres! A once-in-a-lifetime opportunity! Oreo has been gelded and we will continue his show career. NMDA National Show @ The Great Celebration: Oreo Blizzard received a first place in the Foal Class at The Great Celebration Mule and Donkey Show. Then Oreo was named the NMDA 2013 National Junior Champion. Way to go, boy! NMDA National Show @ Kansas Donkey Days: Oreo was 2nd of 6 in the Yearling Jack Class. Then Oreo was 1st of 15 in the Spotted Color Class. 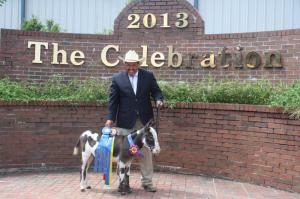 The Great Celebration in Shelbyville, Tennessee: Oreo was 1st of 3 in the Yearling Jack Class. He went on to be named NMDA Junior Champion which was the best over 7 classes. Oreo was then named 2014 Champion ACOSA Jack. 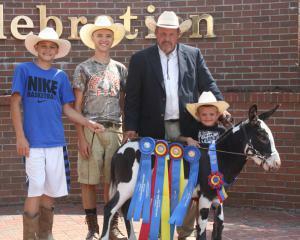 2014 Warren County Fair Mule and Donkey Show: Oreo was 1st out of 2 in the Jack Class. He was then awarded Model Donkey and received 1st in the Color Class. Great job! 2014 Wisconsin State Fair: Oreo was 5th of 11 in the NMDA Yearling Class. Too bad they didn't have a color class. 2014 Midstates Marshall County Mule and Donkey Show: Oreo was 1st of 3 in the jack class and then he won both Model Donkey and the color class. 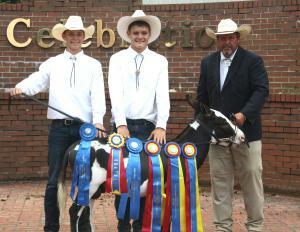 2014 Tennessee State Fair Miniature Donkey Show: Oreo was 1st of 6 in the NMDA Foal/Yearling Jack and Gelding Class. He was then named Champion Jack. He also got 2nd of 16 in the Spotted Color Class. 2015 Coldwater Midstates Show: Oreo was 1st of 3 in the jack class. Then he was Reserve Champion Donkey behind our own Miss B Haven. Oreo was 2nd of 8 in the spotted color class. 2015 ADA Music City Show: First of 2 in the 2-year-old jack class. Then he was named Junior Champion. He was then 1st of 5 in the ACOSA jack class and was named ACOSA Champion Donkey. 2015 Great Celebration Mule and Donkey Show: Second of 4 in the 2-year-old jack class. Then he was 2nd of 5 in the ACOSA Jacks 2 and under. Oreo was named Reserve Champion ACOSA Jack. 2015 Wisconsin State Fair: Oreo was 1st of 2 in the NMDA 2-year-old jack class. Then he was named NMDA Junior Champion. Oreo received the award for the Wisconsin State Fair Grand Champion Halter Donkey. Kansas Donkey Days: Oreo was named ACOSA Champion Donkey. ADA Music City Show: Oreo was named ACOSA Champion Donkey. The Great Celebration: Oreo was National ACOSA Reserve Champion Jack. Wisconsin State Fair: Oreo was named Champion Jack. Kansas Donkey Days: Oreo was named Champion ACOSA Donkey. He then went on to win Champion Jack and Best of Breed. ADA Music City Show: Oreo was Reserve Champion ACOSA Donkey. The Great Celebration: Oreo was National NMDA Champion Jack. He was then selected as Best of Breed and National ACOSA Champion Jack.